Muhammad Ali and artist Doug London have signed this magnificent 27 X 38 canvas giclee’ of Clay standing over Sonny Liston from his famous 60 second knockout of Liston during their rematch fight in Lewiston, Maine on May 25, 1965. 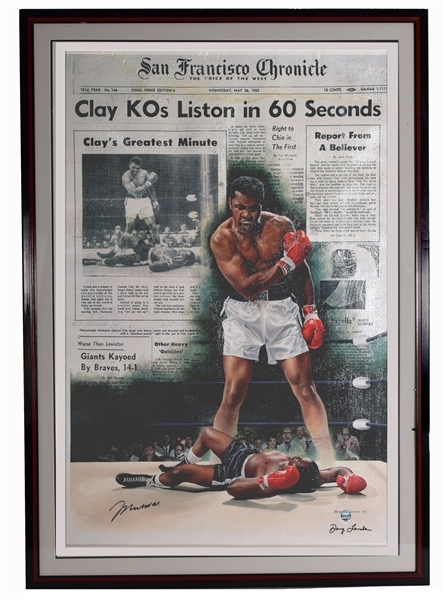 Depicting one of the most recognizable scenes in all of sports history, Heavyweight Champion Cassius Clay stands over Sonny Liston and taunts him to get up after delivering a 1st round knock-out punch often referred to as a "phantom punch." Ali is consider to be the Greatest Heavyweight Champion of all-time and the athlete whom TIME Magazine declared the greatest of the twentieth century. It is framed in a handsome frame with red accent.The Giclee is in good condition but there are a couple of spots and what looks like a little water stain in the top heading of the newspaper. Neither detracts from this amazing image and barely perceptible.